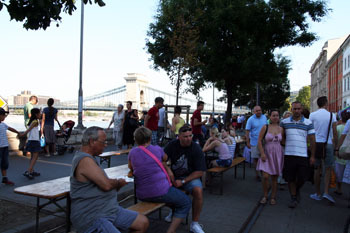 Street of Hungarian Flavours, Budapest 17-20. August 2019. Date Can be Subjet to Change! 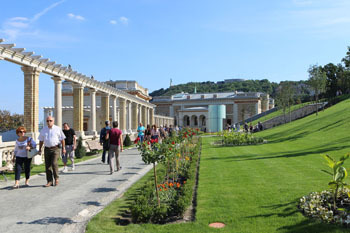 The event is in Buda, on the Upper Bank of the Danube between Várkert Bazaar and Döbrentei Square. By walk only. No public transport due to the programs and the fireworks on 20. August. 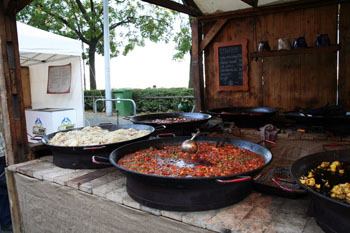 The festival is the biggest gastronomy event in Budapest – apart from the Christmas Fairs at Vörösmarty tér and the Basilica. The location, Várkert Bazaar is one of the newest attractions of Budapest: a series of ornate, 19. century palace buildings with a lush garden. holiday fairs (Christmas, Easter) all year round. The view of the Danube and the landmarks lining the Pest bank is just amazing from here. 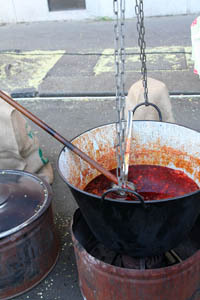 The Street of Hungarian Flavours has been part of the August 20th/St Stpehen’s day festivities for many years now. 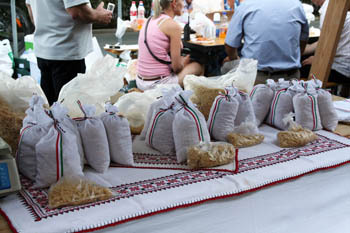 The festival is also the venue where you can first taste Hungary’s Birthday Cake. Each year the guild of Hungarian Confectioners announces a contest to make a special cake from traditional local ingredients. A jury then chooses one over 2 rounds and the winner torte is first sliced on the Street of Hungarian Flavours. This year a rich vanilla-white chocolate-mascarpone mousse torte on walnut-honey sponge base won. Its name is Komáromi Kisleány (Girl from Komárom town) by the Jánoska Confectionery in Komárom! For those who watch their weight or avoid sugar in their diet can have a slice from the Sugar-free Cake – only 242 kcal. In 2018 the guild selected the Three Wishes cake made by the Nándori Confectionery. 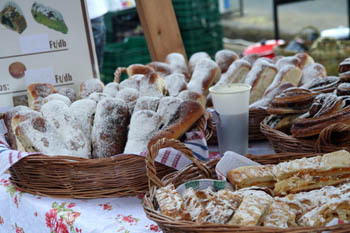 A white sourdough bread called Várhegyi Deres made by the Kurdy Family Bakery. It is a crunchy white wheat bread with a dash of corn and leavened for 12 hours with fesh sourdough. 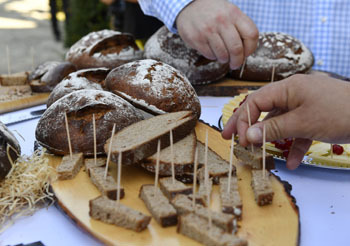 The 2nd bread is a honey apple rye bread with 70% rye flour and 24-h sourdough and seasoned with apple chips and honey. The 3rd you can taste on the festival is a whole sourdough bread made from spelt flour, rye flour and oat flour but the baker also added sunflower seeds, oat flakes and pumpkin seeds. TIP: Browse also our other program recommendations in August!